Puppy training starts the moment you bring your puppy home. Whatever he does, you must react properly or he will learn the wrong things. We always anticipate the joys of all that's good about owning a puppy. But often it doesn't work out as well as we'd hoped. Puppies are delightful bundles of energy and curiosity.... but they can also be exasperating and frustrating. If you respond properly to the challenges of bringing a new puppy into your home, the adjustment period will be shorter and less stressful for both of you. If you do not respond properly..... well, unfortunately that's why so many teenage dogs are turned over to rescue groups and animal shelters. Routines are reassuring to puppies. 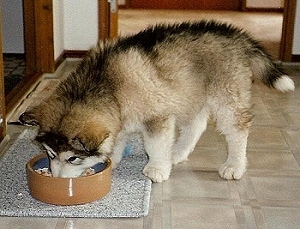 For example, his food and water bowls should stay in one place. First and foremost, teach your new puppy daily routines. Where his food and water dishes are located. What times of day he will eat. What time he goes to bed. What time he gets up. Where he goes to the bathroom. Where his toys are kept. Don't make the mistake of thinking that it doesn't matter HOW you teach each of these routines. It definitely does matter. If you use the right teaching method, your puppy will be better-behaved and will be happy to let you decide what he can and can't do in your family. If you use the wrong teaching method, your puppy will begin making decisions about how he wants YOU to fit into HIS life. That's a recipe for conflict and behavior problems. These words are taught AFTER your puppy has learned the two most important words: "No" and "Good." You must teach your puppy words as well as routines. The most important words are "No" (which means "Stop whatever you're doing") and "Good" (which means "I like what you're doing"). These praise and correction words should be started at 2-3 months of age. You must teach these words properly, with the right tone of voice and the right body language, or they won't be of any help in teaching other words. If your puppy is older than 2-3 months and hasn't learned "No" and "Good" flawlessly, you must start with those words before you can expect success with other word training. Most puppies love treats, but don't RELY on them to teach good behavior. 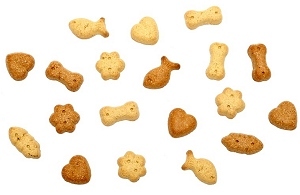 It's a big mistake to rely ONLY on food treats to train your puppy (or a dog of any age). What's wrong with "biscuit training"? It's based on your puppy deciding when he's hungry enough to do what you want. Imagine your puppy running out the front door. You call him, waving a treat. But he'd rather chase a squirrel into the road than come back to munch on a treat. In addition to the obvious danger of Puppy getting hit by a car, he learns that he doesn't have to listen to you. He learns that he's in charge of what he decides to do and what he decides not to do. Now, I'm not saying you shouldn't use food to train your puppy. Food is a great motivator and I definitely use it. But if your training method consists ONLY of giving your puppy a treat to coax him to do what you say, you're going to find yourself in trouble when you want him to do something and he's not hungry.... or when you want him to STOP doing something and he's having too much fun to stop, regardless of the treats you're desperately flinging at him. This sad scenario happens a lot with "biscuit training." It doesn't happen at all with Respect Training. A puppy who is taught to respect you will pay close attention to you. You should teach your puppy to respect you as the leader in your home. Without proper respect, your puppy may learn words and routines but choose not to do them. I'm sure you know dog owners who say their dog "understands" them but doesn't do what they say. That isn't intelligence – it's disrespect. And it can be traced to improper training right from the time the puppy was first brought home. Respect training is not something you can get "almost" right. You must get it completely, consistently right – in a way that dogs understand. I can help you with this. Dogs are capable of learning many words, and there is no better way to get your dog to understand what you want and what you don't want than to teach him carefully chosen words and routines. Of course, knowing which words to teach isn't much help unless you also know HOW to teach them. I can help you with this, too. Keep reading. First, I'll give you a hint. The photo above is cute, but don't expect your dog to want to listen to children's stories! But do expect him to listen carefully to your words, waiting for one he understands. Expect him to be eager to follow your directions. 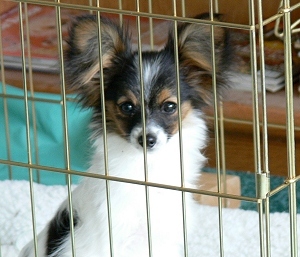 A crate protects your puppy from household dangers and is an invaluable aid in housebreaking. Your puppy's crate is his safe and secure den. Some people mistakenly refer to a crate as "doggie jail" but that is not the way Puppy will view his crate. Oh, at first he might be unhappy to have his movements curtailed, but it won't be long at all before he goes into the crate on his own, to take a nap or just to get away from household activity. For a new puppy, a crate helps with housebreaking and provides a safe den for sleeping. When your puppy is used to his crate, it will be easy to take him visiting, or for trips in the car, or to the vet. When we watch TV, we sit in our favorite chairs and our dogs typically choose to lie down in their crates (doors open), watching the same shows we watch (well, sort of!). Still, housebreaking begins the day you bring your puppy home. Establish the right pattern from the very beginning and Puppy will be housebroken as soon as his internal organs can cooperate. But if you do it wrong, housebreaking will become a nightmare. And sadly, many owners don't realize they're doing something wrong until Puppy's "accidents" have become a bad habit.... and bad habits are hard to undo. So you want to establish the right pattern from the very beginning. There are several methods of housebreaking, including using a crate, an exercise pen ("ex-pen"), a doggy door leading into a small potty yard, or a litter box (for tiny breeds). You'll find detailed housebreaking directions in my puppy training book (see bottom of page) – and yes, I cover each one of those housebreaking methods so you can choose which one works best for your pup and your lifestyle. Start handling your puppy immediately so he learns to accept anything you need to do with him. Your puppy must accept YOU as the leader in your family. Being the leader simply means you are the one who decides what is okay for Puppy to do and what isn't okay. 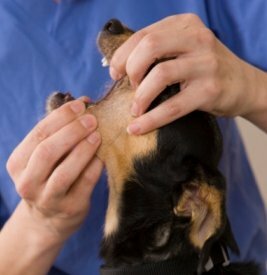 For example.... brushing, bathing, clipping nails, cleaning teeth, giving a pill, putting on a collar or harness. These are all times when YOU – not Puppy – have to be the one to decide what is necessary. Puppy should stand quietly for anything you need to do with him. If you teach words and respect properly, acceptance of being handled will come naturally – they go "hand-in-hand", so to speak! 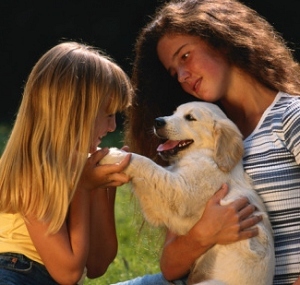 Teach your puppy to be gentle when interacting with people. He must not nip or chew on people's hands. Just like acceptance of being handled, gentleness is taught along with vocabulary and respect training. Puppy's mother (and siblings) began teaching gentleness by firmly correcting Puppy when he played too roughly. Your job is to take over from where they left off and teach Puppy how to restrain himself when he plays with humans. Remember, you must be the one who sets the limits of ALL good and bad behavior. This particular behavior would be a "No." Teach Puppy which behaviors are allowed in your house and which behaviors aren't. Can he take socks out of the laundry basket? Can he sleep on your bed at night? What about barking at strangers he sees through the window? You need to choose the best household rules, then be completely consistent about enforcing those rules. "No!" and "Good!" will serve you well for these puppy lessons, but only if you have taught those words properly. My puppy training book spends a lot of time showing you how to teach those words, and also tells you the best rules to establish with your puppy. Is your puppy older than 2-3 months? You might think a training schedule would be different for an older puppy.... but it isn't. Whether your puppy is 3 months old, 6 months old, or 9 months old, the order of training must start with the same words and respect training I've been talking about. Namely.... daily routines, praise and correction words, crate training, housebreaking, acceptance of being handled, gentleness, and household rules. So if your older puppy is still mouthing on your hands, or barking back at you when you tell him to do something, or if he doesn't stop whatever he's doing when you say, "No", you need to double down on the basics. Sit, stay, heel....older puppies are ready to start learning more advanced words after they are obeying basics such as "No." Don't jump ahead! Come when called. Every time. Go to his dog bed when told, and sleep on it while you're reading or working on the computer. Wait inside the door or gate, even when it's open, until you tell him he can go through. "Give" or "Drop" whatever is in his mouth when told. All of these skills involve Puppy learning new words, but remember, simply knowing what a word "means" won't automatically lead to Puppy DOING it. You need to teach these new words in specific ways that encourage Puppy to view you as a worthy leader. Popping treats into his mouth won't accomplish that. Now, leadership doesn't mean hitting Puppy! Just little things you need to say and do every time you interact with him. These little things are viewed as "leadership" by the canine mind. All puppies misbehave from time to time. How you respond when Puppy misbehaves is very, very important. If you respond the wrong way, he will keep misbehaving. Respond the right way and he will view you as a leader and listen to you. It's best to get this right the first time around, because Puppy won't ever be the same age again. 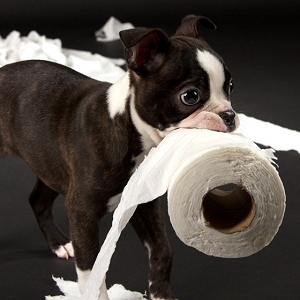 You get only one chance to teach all the right habits to a "clean slate" puppy. If you try to train your puppy without help, you will probably have to re-do the lessons, only this time with an older puppy with bad habits. 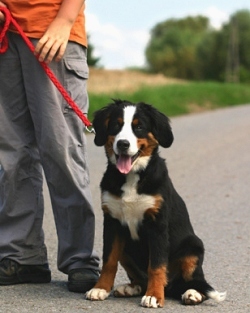 You don't need to sign up for an obedience class to get help training your puppy. 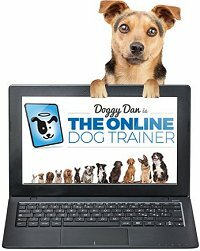 I've taught hundreds of those classes and they can be overwhelming for a puppy. Timid puppies can get over-run by bullies, and excitable puppies just get more excitable. You can teach your puppy at home and I'll help you. My puppy training book is called Respect Training for Puppies: 30 Seconds to a Calm, Polite, Well-Behaved Puppy. I'll show you my proven step-by-step training schedule for teaching your puppy all the words he needs to know, plus consistent household rules and routines, housebreaking, crate training, acceptance of being handled, calmness, gentleness, and general obedience training. Most importantly, this book will show you how to teach your puppy to respect you so that he actually does what you say. Good puppy! You Need Dog Training Help.... But From Where?